Operational intelligence solutions allow enterprises the opportunity to streamline the process of collecting and analyzing machine data. Businesses can accelerate application delivery, monitor and troubleshoot in real time, and improve their security and compliance methods. 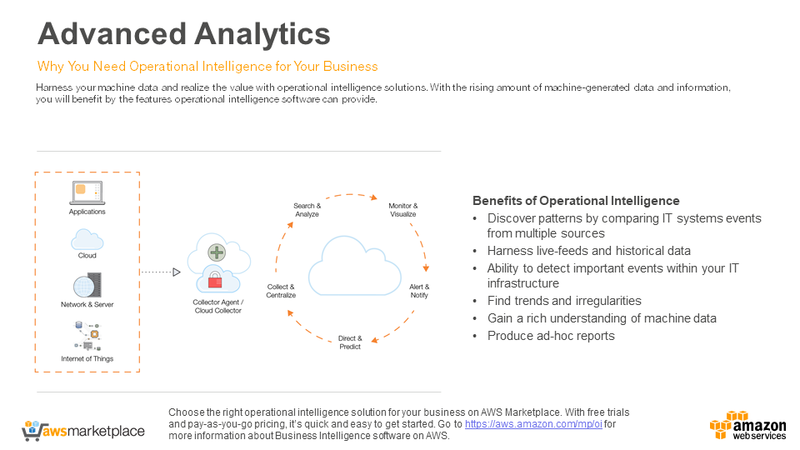 Timely Action: Operational intelligence solutions can leverage businesses existing IT-systems which will allow you to produce analytics-driven processes and workflows aligned with your goals. Immediate Visibility: Business users can visualize information from enterprise systems and Big Data sources to gain intelligence on key business events and processes. Continuous Insight: Businesses can compare and analyze events in real-time from multiple data sources to gain valuable knowledge. Advanced analytics can predict threats and opportunities, and prescribe the next best actions.